To begin doing this guitar birthday cake for a Toby Keith lover, I had to find a pan large enough for the body of the cake. I ended up using a roasting pan. I made 3 different layers. 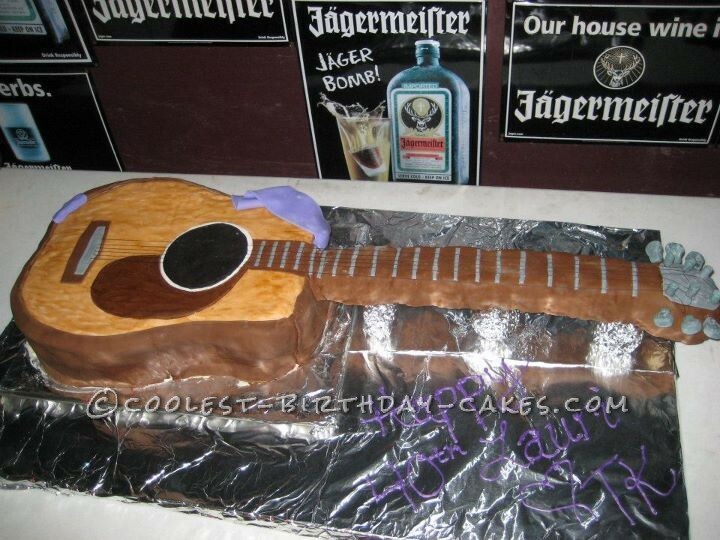 For the side of the guitar I used chocolate fondant. For the top of the cake I used white fondant and dyed it with brown. I wasn’t happy with the way the dyed fondant looked so I ended up hand painting it to give it the look of wood. For the neck and head of the guitar I made rice krispy treats and formed the 2 different pieces. Then put the pieces together with dowel rods leaving about 6 inches out from the next to insert into the body of the cake. I then covered the neck and head in chocolate fondant. Due to the enormous size of the cake the neck was too heavy to stand on it’s own so I had to form 3 little stands to support the neck and head. I made the tuning keys out of gum paste which I dyed a grayish color and made shiny using shimmer dust. To make the strings of the guitar I used regular sewing thread. I am very hard on myself when sculpting a cake and always think there is room for improvement.